A friend gave me this recipe that she got from an Italian lady. It is absolutely delicious. 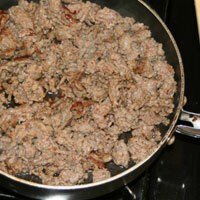 I used Italian sausage in this recipe, but it is equally as good with ham or prosciutto. 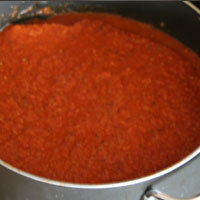 For a real treat use San Marzano imported canned tomatoes for the sauce. They are expensive, but incredibly sweet and saucy. They do have seeds in them so don't puree them or the sauce will become bitter. Instead crush them with a potato masher or a put them through a food mill. First, prep everything for the sauce. Grate the zucchini, squash, and carrots. Chop the onions and garlic. I chop them big because I don’t like a strong onion taste. Then I pull them out after the sauce is cooked. Open the tomato cans. Now you're ready to cook. Heat the olive oil in a large pot over med/high heat. Add the onions and cook until translucent 5-10 minutes. Add the garlic, basil, and crushed red pepper. Cook a minute or two until the garlic is aromatic but not burning. Add the zucchini, squash, and carrots. Cook 5-10 minutes until the liquid from the vegetables comes to a light boil. Simmer a minute or two longer. 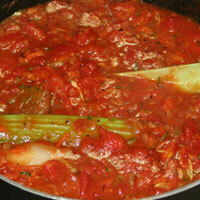 Add the tomatoes and bring to a light boil. Add the celery stalks. Add the bouillon and sugar. Simmer 20 minutes. Add salt and pepper to taste. It is good to wait to salt until this point because the flavors mesh after cooking and it’s easier to tell how much salt is needed. Salting too early often results in over-salting. Pureeing the sauce is optional. I prefer a smooth sauce to a chunky one, but the taste is great both ways. I remove the onions and celery stalks at this point. To puree I put my hand blender in the sauce and puree to the desired consistency. 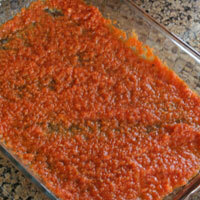 You could also transfer it to a blender or a food-processor just use caution because the hot sauce may splatter. To prevent this put a dish towel on the top then the lid. The sauce is ready to use at this point, you can also heat it covered on the lowest setting longer (up to 12 hours). When I cook it longer, I add the celery stalks back in. You can also cool it and refrigerate overnight. I prefer to do this because it is easier to assemble the lasagna when the sauce it cool. Also, it is nice to have this step out of the way because this lasagna takes a long time to make. 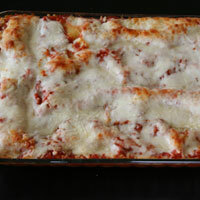 *This is not my favorite recipe for pasta sauce, but for lasagna it's the best! To cook the sausage heat a skillet over med/high heat. Brown the sausage and cook through. Set aside. Hot, mild, or sweet Italian sausage works great. If you are using sausage links be sure to remove the casings (outer “skin”) before cooking. For the besciamella melt ½ c unsalted butter in a saucepan over low/medium heat. Whisk in the flour until smooth. Cook 2 minutes. 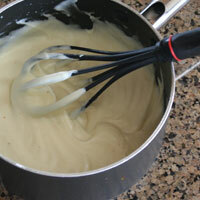 Add half-and-half in a steady stream whisking constantly. Cook until thickened. 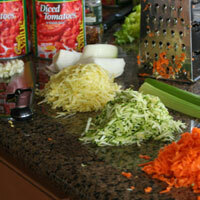 Add the nutmeg, it adds a wonderful subtle taste to the lasagna. Don't put in too much or it will be overpowering. Set aside. Preheat the oven to 350. In a 9x13 pan pour in 1 cup of sauce. Place 4 lengthwise in the pan and one widthwise. The width-wise noodle is a bit too long, so break a little off the top to make it fit. Layer generously with sauce (1-2 cups) and half the sausage. Layer with half the besciamella (this is tricky because you don't want to mix the besciamella with the sauce so drop or pour it as evenly as possible). 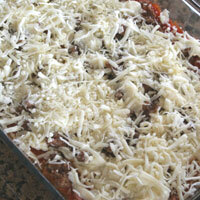 Layer 1 cup of mozerella, and 2 T fresh parmesan (you can use grated but reduce to 1 T because it is saltier). Layer 5 more noodles and repeat with sauce (1-2 cups), the rest of the sausage, the rest of the besciamella, 1 cup mozerella, and 2 T fresh parmesan. Layer 5 more noodles, the remaining sauce, the last cup of mozerella, and the last 2T of parmesan. 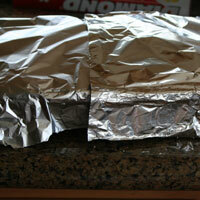 Cover with foil (tent the foil a bit so the cheese doesn’t stick to it). It is ready to be baked at this point or it can be refrigerated for up to a day. Be sure to cool it to room temperature before refrigerating it. Bake for 45 minutes covered and 15 minutes uncovered. Insert a knife to check if it is done, if it goes through with a bit of resistence it is al dente and ready to remove from the oven. Let it sit for 10 minutes before cutting and serving. 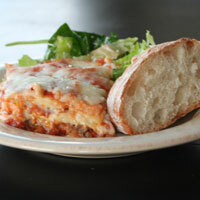 The most difficult thing about lasagna is getting the moisture content right. 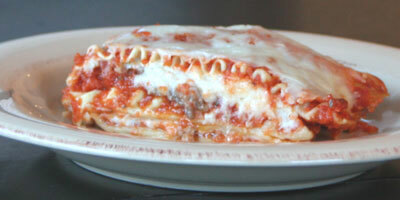 I've made lasagnas at are too dry and too wet. This recipe is just right and I haven't failed with it yet. Just be sure not to over or under cook it. 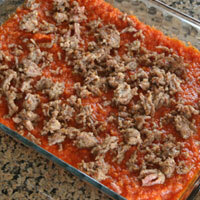 I once tried this with a regular tomato sauce and didn't add the vegetables (squash, carrots, zucchini, and celery). It was not nearly as good. The tomato taste was too strong. 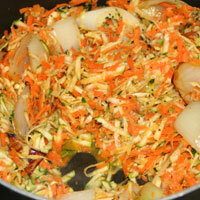 The vegetables give it a good rounded flavor. 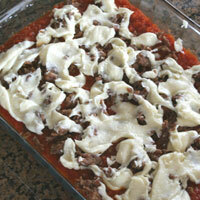 The sauce recipe is perfect for lasagna, but I don't like it much when used as a pasta sauce. My favorite variation is with ham and crumbled hard boiled eggs in place of the Italain sausage. The eggs sound strange, but taste great. My husband learned this in Sicily. The besciamella can be spread right on the ham which distributes it much more easily. Sliced eggplant it a wonderful addition to this lasagna. Peel and slice thin (1/8-1/4 inch) two medium eggplants. Heat olive oil in a pan over med/high heat. Cook each slice through and set on a paper towel to drain. Gently press out extra moisture with a paper towel. Layer in lasagna. *Eggplant let off a lot of moisture so be sure they are cooked through and drained well. Fresh mozerella and basil are very good in this recipe. Add the basil the last few minutes of cooking the sauce, and omit the dried basil. Fresh mozerella can be sliced thin and layered or shredded. Shredding is messy because it's so soft. Fresh tomatoes aren't worth the work here. The long cooking times take away the fresh flavor. Now you're ready to cook. Heat the olive oil in a large pot over med/high heat. Add the onions and cook until translucent 5-10 minutes. Add the garlic, basil, and crushed red pepper. 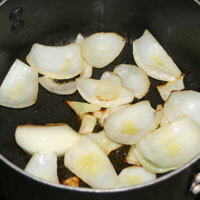 Cook a minute or two until the garlic is aromatic but not burning. Add the zucchini, squash, and carrots. Cook 5-10 minutes until the liquid from the vegetables comes to a light boil. Simmer a minute or two longer. Add the tomatoes and bring to a light boil. Add the celery stalks. Add the bouillon and sugar. Simmer 20 minutes. Add salt and pepper to taste. It is good to wait to salt until this point because the flavors mesh after cooking and it’s easier to tell how much salt is needed. Salting too early often results in over-salting. Pureeing the sauce is optional. I prefer a smooth sauce to a chunky one, but the taste is great both ways. I remove the onions and celery stalks at this point. To puree I put my hand blender in the sauce and puree to the desired consistency. 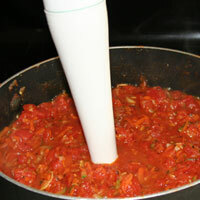 You could also transfer it to a blender or a food-processor just use caution because the hot sauce may splatter. To prevent this put a dish towel on the top then the lid. The sauce is ready to use at this point, you can also heat it covered on the lowest setting longer (up to 12 hours). When I cook it longer, I add the celery stalks back in. You can also cool it and refrigerate overnight. I prefer to do this because it is easier to assemble the lasagna when the sauce it cool. Also, it is nice to have this step out of the way because this lasagna takes a long time to make. Measure the mozzarella and parmesan and set aside. Preheat the oven to 350. In a 9x13 pan pour in 1 cup of sauce. 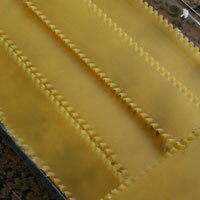 Layer with 5 uncooked lasagna noodles. Place 4 lengthwise in the pan and one widthwise. The width-wise noodle is a bit too long, so break a little off the top to make it fit. Layer generously with sauce (1-2 cups) and half the sausage. Layer with half the besciamella (this is tricky because you don't want to mix the besciamella with the sauce so drop or pour it as evenly as possible). 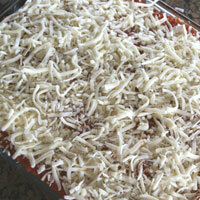 Layer 1 cup of mozerella, and 2 T fresh parmesan (you can use grated but reduce to 1 T because it is saltier). Layer 5 more noodles and repeat with sauce (1-2 cups), the rest of the sausage, the rest of the besciamella, 1 cup mozerella, and 2 T fresh parmesan. Layer 5 more noodles, the remaining sauce, the last cup of mozerella, and the last 2T of parmesan. Cover with foil (tent the foil a bit so the cheese doesn’t stick to it). It is ready to bake or it can be refrigerated at this point for up to a day. Be sure to cool it to room temperature before refrigerating it.